Eating healthy and adjusting the palate. I want to have an in depth look at another aspect of the Free Living Fitness manifesto. Wellbeing is not a competition. Sports are competitive by their nature, some fitness activities like body building are also competitive, but taking care of your body should not be, that's between you and your body. Often when I am in the gym, I see people lifting weights with bad form. They lift the weight, then drop it, not completing a full cycle of the rep. Or they lift too fast to properly get the benefit of using the whole muscle. Or they use form that reduces the isolation, for instance using more of their back than necessary in a shoulder exercise. All of these things achieve one "false" result: They allow you to lift a heavier weight. Why lift in a way that reduces the efficacy of the exercise, gets you slower gains and potentially hurts you? Because the number on the weight is bigger, and being able to quote a big number puts you ahead in the gym competition. But there is no gym competition. This is about you and your body. Forget the numbers, make the most of your precious gym time. In our social media age, informal gym competition has become about images. We are supposed to feel inspired by people's gym selfies and healthy meal pics, but if you find yourself feeling lessened or demoralised by the highly edited and filtered insights into other people's fitness routines on Instagram, step away from the screen. It's not helping you. Your fitness is about you, and every person is different, so don't worry about someone else's yardstick. Your age, medical history, genetics, personal commitments, exercise experience and current health all affect your fitness and make you, in this moment, unique. 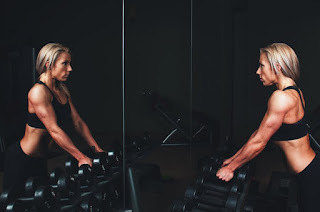 No one else's routines will suit you perfectly (this is why personal trainers exist, to programme exercise just for you), no one else's goals are perfect for you, so aiming to be "better" than someone else is either going to be futile and demoralising or meaningless. Be inspired by others, support each other, a bit of friendly competition can be motivating, but don't let it get to you, it really is the taking part that matters. Remember that the real goal is being healthier and feeling better in yourself, if competition is making you lose confidence or push yourself too hard, or in the wrong direction, you are losing sight of what's important. "Competing with yourself" is, in theory, the most healthy kind of competition. It's part of my function as a Personal Trainer to take data from clients, help them make goals and keep taking that data as they become improved, healthier versions of their former selves. But I've been thinking a lot about the impact that this approach, in isolation, can have on an individual and their progress. For instance, going on bodyweight alone, it's very easy to become disillusioned when progress appears slow - even though we understand that it is possible to undergo massive changes in body composition without changing weight, as the fat lost is equalled by muscular gains. So it's important to use other measures, body size, composition, fitness tests, wellbeing questionnaires, to remind ourselves that we are making progress in some areas, even when others feel static. It's also necessary to understand that sometimes progress will stop, or we will go backwards, and that is normal and healthy too. Sometimes, we will regress. It happens. A key reason for gains slowing can be overtraining, which really confuses the issue. It's hard to believe that training less might help you improve your fitness faster, and it's even harder to sit on your hands and take that rest to prove it to yourself. Sometimes you'll have other challenges. A busy work schedule gets in the way of training, or a bout of illness forces you to take a break. It's easy to let things get on top of you and suddenly the cornerstones to basic health are slipping, you feel less well and you feel bad about yourself because you can see that you are not competing effectively with your former self - that shame leads to demotivation and things get worse. Another classic example of this is pregnancy. I've been a pre and postnatal yoga teacher for several years now and I've seen this a lot, both in my clients and my fellow yogis. There is a frustration that manifests as the body's resources are increasingly concentrated towards the baby. I've known yoga teachers who have steadfastly insisted on continuing highly demanding practices (like headstands) right to the end of pregnancy, and then pushed themselves hard in the postnatal period, determined to return to their pre-pregnancy condition as fast as possible. I'm not judging here, because I'm the dancer who was in dance class 10 weeks after my second c-section, partly because I *needed* to dance, but also because I couldn't bear my skills deteriorating further. This isn't healthy competition, it's potentially damaging, and we need to be aware, and sympathetic to what our body is capable of in the present, being prepared to take a step back and let ourselves heal and recuperate where necessary. That's taking care of your body too.